The purpose of this lesson is to introduce students to forces and motions of objects through experimental design using paper airplanes. The concepts taught include drag, lift, thrust, gravity, and aerodynamics. Explain how drag, lift, thrust, and gravity affect the motion of a paper airplane. Measure distances using the metric system. Graph and record data in metric units distance vs. time. Plan and conduct an investigation using inquiry and process skills. Record data and develop a conclusion from their data. Have you ever wondered what makes a paper plane fly? Some paper planes clearly fly better than others. But why is this? One factor is the kind of design used to build the plane. In this activity you'll get to build a paper plane and change its basic design to see how this affects its flight. There's a lot of cool science in this activity, such as how forces act on a plane so it can fly. So get ready to start folding! The forces that allow a paper plane to fly are the same ones that apply to real airplanes. A force is something that pushes or pulls on something else. When you throw a paper plane in the air, you are giving the plane a push to move forward. That push is a type of force called thrust. While the plane is flying forward, air moving over and under the wings is providing an upward lift force on the plane. At the same time, air pushing back against the plane is slowing it down, creating a drag force. The weight of the paper plane also affects its flight, as gravity pulls it down toward Earth. All of these forces (thrust, lift, drag and gravity) affect how well a given paper plane's voyage goes. In this activity you will increase how much drag a paper plane experiences and see if this changes how far the plane flies. • Large open area in which to fly a paper plane, such as a long hallway, school gym or basketball court. 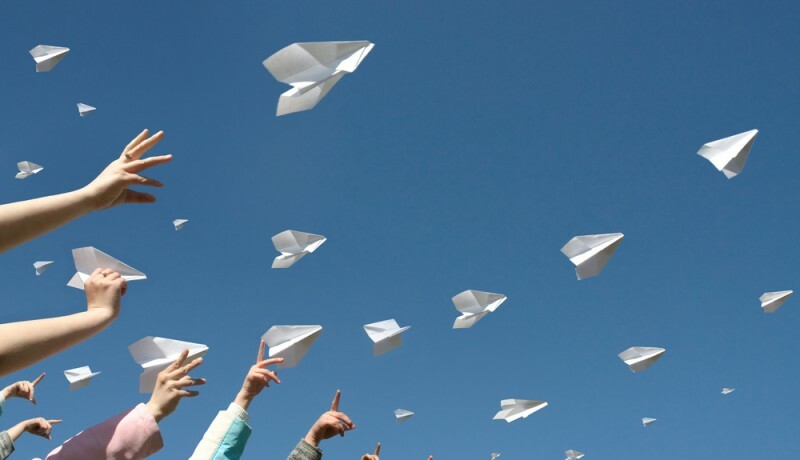 If you're flying your paper plane outside, such as in a field, try to do it when there isn't any wind. • Something to make at least a one-foot-long line, such as a long string, another ruler, masking tape, rocks or sticks. • Make a standard, "dart" design paper airplane (for instructions, go to the Amazing Paper Airplanes Web page ). • Fold your paper into the basic dart paper plane. Fold carefully and make your folds as sharp as possible, such as by running a thumbnail or a ruler along each fold to crease it. Do not bend up the tailing edge of the wings (step 6 of the online folding instructions). • Go to a large open area and, using string, a ruler, masking tape, rocks or sticks, make a line in front of you that's at least one foot long, going from left to right. This will be the starting line from which you'll fly the paper plane. • Place your toe on the line you prepared and throw the paper plane. Did it fly very far? • Throw the plane at least four more times. Each time before you throw the plane, make sure it is still in good condition (that the folds and points are still sharp). When you toss it, place your toe on the line and try to launch the plane with a similar amount of force, including gripping it at the same spot. Did it go about the same distance each time? • Once you have a good idea of about how far your plane typically flies, change the plane’s shape to increase how much drag it experiences. To do this, cut slits that are about one inch long right where either wing meets the middle ridge. Fold up the cut section on both wings so that each now has a one-inch-wide section at the end of the wing that is folded up, at about a 90-degree angle from the rest of the wing. • Throw your modified paper plane at least five more times, just as you did before. How far does the paper plane fly now compared with before?Why do you think this is, and what does it have to do with drag? • Extra: Make paper planes that are different sizes and compare how well they fly. Do bigger planes fly farther? • Extra: Try making paper planes out of different types of paper, such as printer paper, construction paper and newspaper. Use the same design for each. Does one type of paper seem to work best for making paper planes? Does one type work the worst? • Extra: Some people like to add paper clips to their paper planes to make them fly better. Try adding a paper clip (or multiple paper clips) to different parts of your paper plane (such as the front, back, middle or wings) and then flying it. How does this affect the plane's flight? Does adding paper clips somewhere make its flight better or much worse? Did the original plane fly the farthest? Did the plane with increased drag fly a much shorter distance? As a paper plane moves through the air, the air pushes against the plane, slowing it down. This force is called drag. To think about drag, imagine you are in a moving car and you put your hand out the window. The force of the air pushing your hand back as you move forward is drag, also sometimes referred to as air resistance. In this activity you increased how much drag acted on the paper plane by making a one-inch-high vertical strip on both wings. For example, this is what happens when you're in a moving car with your hand out the window and you change its position from horizontal to vertical. When your hand is held out vertically, it catches a greater amount of air and experiences a greater drag than when it is horizontal. You could probably feel this, as your hand would be more forcefully pushed back as the car moves forward. This is what happened to the modified plane—it experienced a greater amount of drag, which pushed it back more than the original plane. This experiment has clearly demonstrated that altering how just one force acts on a paper plane can dramatically change how well it flies. Recycle the paper plane when you are done with it. Aerodynamics: A section of physics dealing with fluids (both liquids and gases). Airfoil: The cross-section of a wing. Ailerons: Movable hinged sections on the trailing edge of each wing that are used to control roll. Angle of attack: The angle that is required to generate lift. It is the angle between the airspeed vector and the chord of the wing. Bank: The angle between a line drawn through the wing tips and the ground; when a plane rolls, it changes its bank. An aircraft makes a banked turn by dropping the inside wing and raising the outside wing. Camber: The amount of curvature in the centerline of an airfoil, usually expressed as a percentage of the length of the airfoil's chord. Center of gravity: The point where the plane will balance. Chord: A straight line that connects the front edge to the trailing edge of an airfoil. Control surfaces: Ailerons, elevators, and rudders. These surfaces control rotation in roll, pitch and yaw respectively. Dihedral angle: The upward angle of the wings that is formed where the wings connect to the fuselage. Drag: The retarding force parallel to the direction of movement. Elevators: Control surfaces on the horizontal part of the tail that are used to allow the airplane to control pitch. Raising the elevators will cause the airplane to increase the angle of attack. Equilibrium: When two or more forces act and cancel the effects of each other. The end result is that there is no change in speed. Fin: Another word for the vertical portion of the tail, also called the vertical stabilizer. Flaps: Movable parts of the trailing edge of a wing that are used to increase lift (and drag) at slower air speeds. When a plane lands, the flaps are extended to increase lift and drag, to fly at a slower speed. Flaps increase lift by changing the shape of the airfoil. Force: A push or a pull in a certain direction. Force is measured in “Newtons”. Force (Net) = a net force occurs when forces are unbalanced. For example, if a plane reduces its thrust, then drag because the net force. In the example below, drag has a net force of 15 Newtons. This net force is capable of accelerating (slowing down) the plane. Net force is also known as a resultant force. Force (Unbalanced) = an unbalanced force means resultant or net force. See Force (Net). An unbalanced force is capable of accelerating a mass. Gravity: An attractive force between all objects. We feel the pull of gravity toward the center of our planet. We experience gravity as weight. An airplane must generate enough lift to counteract its own weight. Horizontal stabilizer: The horizontal portion of the airplane tail. Inertia: Property of matter that resists any change in motion. Kinetic energy: The work an object can do because of its motion. It is the energy of a moving object. Leading edge: The front edge of a wing. Lift: When a plane flies level, lift equals weight. Lift is perpendicular to the direction of motion. Pitch: The angle between the fore and aft axis of the plane and the ground. A change in pitch points the nose of the plane up or down. Elevators control pitch. Your head moves in pitch when you make a "yes" motion. Roll: Rotation about the centerline of the plane. Describes the tilting motion of the plane when one wing rises or falls in relation to the other. Ailerons control roll. Your head moves in roll when it moves "side-to-side." Rudder: Control surface on the trailing edge of the vertical part of the tail. The rudder controls yaw. Stabilizer: A surface that helps to provide longitudinal stability for an aircraft, stability in pitch. Stall: A breakdown of the smooth flow of air over a wing. Flying a plane at a large angle of attack can cause a stall, which increases drag and often results in a decrease in lift as well. Stall generally occurs at an angle of attack between 10 and 15 degrees. A stall can also occur if a plane flies too slowly. Streamline: To smooth an object's shape so that it creates less drag. Thrust: A force created by the engines that push or pull an aircraft through the air. Thrust acts against the force of drag. Trailing edge: The back part or rear edge of a wing. The trailing edge is normally thin and sharp. Turbulence: Airflow that is not smooth and steady. Unbalanced Force: An unbalanced force is capable of accelerating a mass. See net force. Vertical stabilizer: The fin, the vertical part of the tail. Weight: Weight pulls an aircraft toward the earth. In steady flight, lift equals weight. Wind tunnel: A wind tunnel is an enclosure in which a model of an airplane or part of an airplane is placed. Air is passed by the model at a known velocity, so that the model experiences the forces as if it were actually flying. Wing: A surface that produces lift. Wing Area: The surface area of one side on the wing. Yaw: The sideways angle between the direction of movement and the center axis of the plane. Yaw occurs when the nose of the plane turns left or right to the direction of its motion. Rudders control yaw. Your head moves in yaw when you make the "no" motion.